The sun is warm and hare feels safe, no prying eyes, no-one to disturb, as we watch and wait. We, her friends, she knows, as creatures do, we mean no harm. We revere her ancient knowledge; we sit quietly under the half-leafed trees. There is no rush, hare’s relaxed. She breathes in deep, as do we, of green things growing, sun-warmed earth, fresh dew-washed grass, the elixir of spring. Her eyelids droop and slumber comes upon us all. A triangle of leisure, time ceases to exist. We are at one with hare’s rhythm; deep, deep, the earth our softest bed, protecting the pathway where hare has led. Shh … listen, is that the huntsman’s call? We watch, as down time she’s led, we see her everlasting life. She runs and runs, persecuted, dogs a-lunging, the men pursue. They love the sport, ‘tis something to enliven their mundane Victorian existence, as Sunday well spent and something for the pot. But not our hare, she’s too fleet, she skips away; she’s not their prey. Come, come, she calls, as thru our inner eye we see, she’s taken on a different shape; fur draped around merchant’s corpulent shoulders. He struts around quay side and medieval market town. “What’s this, what’s this,” he cries, “’tis not a groat I’ll part with for shoddy goods, not I.” But hare’s alright, she’s there, not another victim to the coney-skinning knife. Don’t linger, times a-fleeting, she leads the way down the dreamscapes path, “They’re coming, hasten, a job’s to be done.” “No, not this way,” we cry. Hare’s insistent we see, but we know the outcome and so must she. It has to be done, we watch fearful, helpless, as marching feet do tread our land; o’er hillside they’re spread, in tens and tens of ten, armour glinting, spears sharpened. As down in the valley, one woman brave awaits the determined hoards, her army no match, but fearless ne’er the less. “The portend, ‘tis victory I spy,” she cries as hare leaps and runs from the folds of blue cloak. Long red hair streaming, the woman commands her chariot, knives flashing, as proudly she rides. “Icini or die,” as screaming for victory Bouadicia rides out. We watch from the shadows, the bags and the runes, the candles and lanterns, the rugs and the food. Our hare scurries this way and that, paws flashing, there’s not time to waste. She’s been here before as freshly washed, brushed and gowned the Lady leads us out of her door. What are we doing here? We are totally amazed, the same place we started, but now, no sun’s haze, now deep dark, the tree’s eerie spread, we follow closely, fearful to tread. Oh hare of night shadows we go where we’re led. A clearing, a space and, as moonlight falls, we see silvered, ‘tis not scary at all. The Lady she circles, around and around, as hare sets up the tools of magick upon the ground. Then all’s ready, we’re invited to join. Now it’s sacred the circle, powers raised, candles lit, invocations chanted, calling out thru the night, the Lady’s sweet voice raises high the magick. She’s a priestess, all powerful, the hare her familiar. We are in ecstasy; the incense is swirling, the fire is burning, its flames a sparking. As then … all goes silent, we sense there’s a change, we gaze up at the moon, floating high, so serene, so bright of fullness, we are fully in tune. Oh, bright silver, a soft rosy-golden skirt surrounding its splendour; a stir in the branches, a soft perfume, a lulling rhythm of music to mesmerise our perceptions. A pathway’s appearing from celestial orb; stark, diamond-white it streaks thru the dark. Down, towards us it comes, thru tree-top and branches to lay on the ground. A figure so feminine, so graceful, so wondrous to behold, floats serenely towards us, arms uplifted wing-like. Her amulets glowing gold, with sapphires shot thru, purest white silken gown, shimmering, iridescent as a moon beam, clothes the Lady’s majestic figure. Her swan-graceful neck encased in gold, falling like teardrops, twinkle the diamonds, turquoises, lapis-lazuli and rubies towards her breasts. While the frame for her alabaster face is hair of raven hue, upon which gold encircles and the serpent of Egypt stands proud. Deep, mysterious eyes, elongated, the blackest of lines decorate their beauty; they absorb us, draw us into Her power. To look is surely not enough, to worship is a dream. No, we are submerged; we are drowning, as down and around, within and without, the Goddess encompasses us in Her power. We stand immobile, no move can we make, The moon goddess has taken our will and hearts to mould as Her own, Her beauty enraptures, Her aura surrounds us, we are woven into Her spell. No words are spoken, no words are needed. She communes Her sacred spirit with ours, the mystical moon power she exudes streams into our soul, and we feel its feminine divineness pulsing thru our very life. The supreme goddess of infinity, she has transformed us.…. en-circled, we bow before her. The white gowned figure smiles from lips of ruby hue and beckons to hare, and, ears alert, she hops over and sits at the Goddess’s sandaled feet. We watch in awe, as the silver lady of the night bends down and picks up the trembling figure. 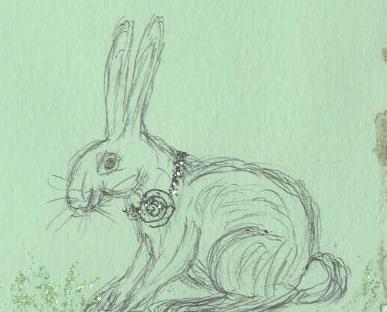 Our hare is held with gentle graceful fingered hands, their bejewelled rings flash and sparkle as, stroking her hair, the Goddess draws the symbol of the spiral upon her soft fur. Our hare is transformed, a familiar, a help of the divine feminine. Our Lady gently places hare upon the ground and stands a while, so still, we can’t breath, don’t break the spell. We gaze in adoration upon her awesome beauty, the power she personifies. The Goddess of the moon raises her hand, and the moon-path returns. Oh Goddess, dearest honoured Lady, don’t leave us, we plead, as back up the silver path the Goddess ascends floating up past the stars, the white steps take Her to the portal of Her sky-ridden domain. The gateway opens, she turns and waves, the moon-palace enfolds Her, the white marble towers shield Her from our gaze. A cloud passes over, the nights chill and dark; we’re surrounded by trees, their trunks hard and stark. But we have the warmth and light of the Goddess within us, we are not alone, we have been moon-touched and it’s time to go home. The witch priestess, for this is she, says wise words, said knowingly, “You have witnessed the beginnings of time. Great Isis of the Moon gave the knowledge to the hare; hare is the keeper of secrets, the earth’s sacred book. She is the marker of the labyrinth and the great sacred symbol of the universe is hidden under her soft fur. Go now, but remember and recall all you have learnt, the hare guides wisely, follow her way. The witch, she fades thru the trees, a shadow no more we turn to follow. Where’s hare? A footprint to follow as suns light dawns, a time-dream she’s led us, we are awakening to the long hidden lore and we follow her pathway, more wisely than before.